Thanks Joe. That's the one. To save the problem of dead links for future readers of this, look in ebay for; "3 Pin to 16 Pin OBD2 Adapter Connector Diagnostic Cable Lead Wire for Fiat" Hope that helps others. With great relief I can now say my air bag system is reset and the light is out, and the MoT is done. But it was not from the cables and software recommended on this forum. After showing the garage the correct ecu port they were able to talk to the ecu with their machine, which is a 'Snap-On Modus Ultra' but with using leads from their previous diagnostic machine, a Solus Probe (the engineer thinks that the Solus Probe would have worked too, but cannot confirm that). This is great because I tried to download the trw2scan and was told a FTD2XX.dll file was missing and I thought "Here we go", round and round trying to get the software downloaded, but the garage phoned today and told me the good news. Perhaps the cables I have bought will be useful for other diagnostic work later. So the conclusion, your local garage can reset your air bag if they have the right machine and know the correct ecu port to enter. Remember, the light not going out is an MoT failure, so get it fixed or, If you're happy for the air bag to be disabled, remove the bulb remove before putting the car in for MoT (You can't take it out after an initial fail as the tester knows the air bag is not funtioning, if there is no light in the first instance then he can't know there is warning system at all). Love and pace to all. Well done Andrew, the cables recommended would rest it but like yourself I use a more modern Modus unit with older cables. Simply unplugging the connector from the Airbag ECU which is bolted to the transmission tunnel, behind the centre console, is far quicker than removing bulbs from the dash. I did quite a bit of rooting around looking for the correct port but I didn't see the ecu itself (or if I did I didn't realise it), so if anyone has a photo of it that might be handy. So now I have cables to tap into the ecu (not just the airbag ecu but also other systems I presume as all the ecu ports seem to be the same) what other uses might they come in useful for? btw, the air-con is now working after some 5 years or so without it. Yipee! It only needed a new condensing rad and dryer! I had to turn it off on the way home from getting it charged as it was too cold! 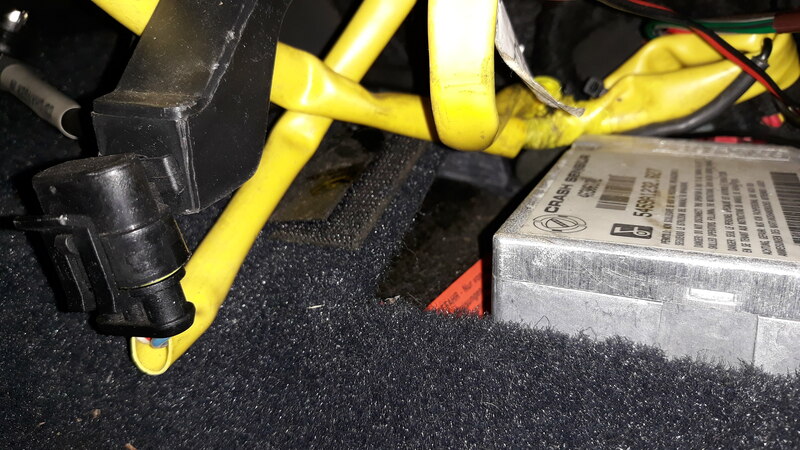 The airbag ECU is bolted to the central raised part of the floor underneath the heater / centre console. If you have "plus" carpet extensions, the ECU, cabling and diagnostic socket will be hidden. Otherwise, all that stuff is easy to locate when looking from the passenger foot well. Just look for the cables with a yellow sleeve. This pic shows the cables/sleeve, and shows the paper label still attached referring to "EURO-BAG" (and "CRASH SENSOR" on the ECU) as a clue. Here's a clearer pic of the ECU and diagnostic socket (lower left, it plugs into a dummy connector attached to a metal bracket). well my car has a three wire socket so i would like to try to reset the light BUT - which of the three wires do I ground? 7 blinks = supply voltage less than 9.5V. Well I checked the voltage at the battery and get 13.5V. so that is a start. I suppose I now need to check the voltage at the fuse supplying the airbag control unit. I think one of the options is to reset the system. That would be a good place to start, since it will get rid of errors that have appeared in the past but are no longer present. a good idea barnacle - but how to do it? p.s. if the fuse supplying the control unit is the one shown in my handbook ( just one of the general fuses in the box in the footwell) that is ok and giving around 13.5V. After repairing the fault, repeat the test to make sure there are no other faults present. Bear in mind that the control unit communicates one fault at a time, until the system has been fully repaired. After completing the repairs, delete the memory by connecting the terminal no. 3 of the control unit for between 1 and 5 seconds. All the errors in memory must be deleted one at a time, repeating the procedure each time until the memory is deleted. Which is not terribly clear, but I read as saying repeat the test multiple times until you get a single blink. Last edited by barnacle; 03/11/2018 20:29. "delete the memory by connecting the terminal no. 3 of the control unit for between 1 and 5 seconds"
connecting it to earth ? I can only assume so. I would like to clear this one up first because I think it might be causing the other two errors. I guess this is the supply voltage at the fuse. Can anyone confirm it this is the regunar fuse in the fusebox or if there is a separate one for the airbag control unit? The voltage error doesn't mean that the voltage is low right now, it means that at some point since errors were last cleared that the airbag ECU has seen a low voltage (maybe even just for a second) and as that may have caused a "brown out" fault or corruption of the ECU then it's flagged as an error. Most likely your battery voltage got low at some point, but if it's OK now there's no point in checking fuses and voltages expecting to see a low reading. Once the errors are cleared if you see the low voltage error again then you may want to replace your battery if the car is left standing without starting for a week or two. If the car is driven every day and you see the low voltage error appearing again then it would be time to start investigating the electrics for problems or a high current drain. I would agree with your assessment: connect it to earth (middle pin if I recollect correctly). Each time you do it, it will flash out any stored errors. It will also clear those which are no longer active. So I'd take several attempts to read the errors and see if you get back to a no-error state. Or at least just one error to fix. so, thanks Barnacle. We are moving forward. I have now reduced the fault codes down to one. 4 flashes = wiring of module trigger circuits in contact with earth. That sounds like a short circuit on the loom somewhere. The back of the radio is a common area for short circuits, and the wiring is probably going to be going somewhere in that area. I *believe* that the 'module trigger circuits' are the drive signals that fire the airbags - either the passenger's above the glovebox, or the steering wheel. Hmm, perhaps there's an issue with the clockspring in the steering wheel? Ref your first sentence, do you think I only need to restrict my search to the yellow sleeved part of the loom - or the whole loom in general? It's been a few years since I've looked at the loom in that area, but *as far as I remember* all the airbag loom has yellow sleeves. "4 flashes = wiring of module trigger circuits in contact with earth" so I need to now start dismantling either the drivers or the passengers airbag to invesigate further. I would appreciate some advice on which side is the most likely culprit? The moving parts are in the steering wheel, where the clockspring carries the signal. Other than that, you're looking at vibration chafing the insulation in the loom. I think it's unlikely to be anything in the airbag units themselves. One thing to remember: the airbag is an explosive device... when dealing with it, first remove the battery and wait half an hour for any residual capacitors to drain before you dive into the wiring. Error n°4 is probably the clockspring. Today I fitted another ECU. Again, as I fried the previous one at the same time I fried the main ECU... Light off, but only for a few seconds. I've been able to clear 2 of them, the one about the voltage, and the one about the bulb wiring (will maybe reappear). The unknown error n°9 is no longer there, and error n°4 neither. I repplaced the clockspring a few months ago (but the ECU was dead) so it must be the reason. But I don't have a passenger airbag. There is a resistor (I think) behind the glovebox, it gives me 3 Ohms when I measure it. I don't understand this error. 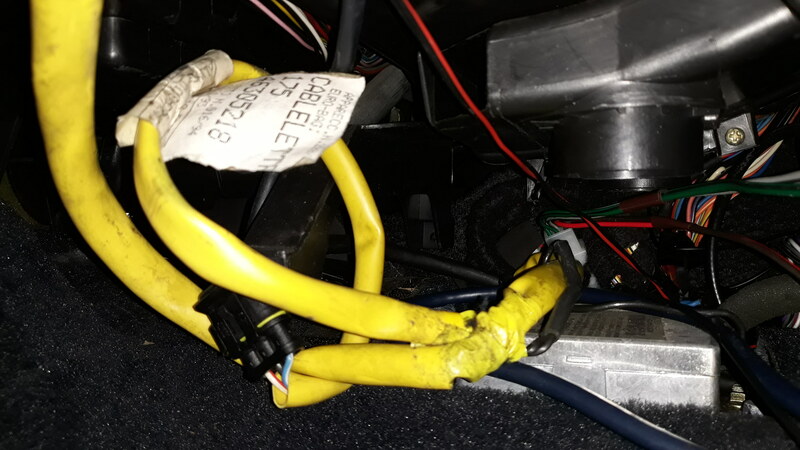 I don't understand how the ECU can know it comes from the passenger side as all the cables going to the driver and (supposed) passenger airbag are connected together on the ECU plug. Maybe it says it comes from the passenger side by default (because it can be disabled manually if present) and in reality it comes from the driver side ? Last edited by Yann; 09/01/2019 18:58. I tried disconnecting the driver airbag, and it triggers the error related to it, so it's not the culprit. Maybe the resistor in the passenger side is not correct anymore. Anyone knows what the resistance value should be ? After searching the forum, I found that 2.2 Ohm resistance should do the job (and now I see in the manual that the airbags are 2.15 Ohms +/- 0.35). THe one installed is 2.7 Ohms. So I tried with a 2.2 one, tried to clear the fault, it didn't work, but after starting the engine, the light turned off. I decided to replace the old resistance by the new one on the original plug, and tried again. Light came back. And starting the engine / trying with another resistance without soledering it doesn't change anything. What's wrong ? Can the light go off if I drive the car a bit (the manual states there is an initial test when switching the ignition ON then a continuous test while driving) ? Ok, easy fix. Fitted another airbag ECU today after reading this http://forum.alfa145.com/index.php?showtopic=9670, no more passenger airbag error. I will ask for a refund for the defective unit. Last edited by Yann; 31/01/2019 15:14. 1) I used trw2scan with a standard VAGCOM/KL OBD cable and the 3pin Fiat adapter - connected to the loose cable-connector coming out from airbag sensor unit behind the radio. 3) I the end I made a short from ABS to airbag lamp behind dash - neatlyturns on/off together (= looks correct). You can't always exchange airbag units btw diff coupe models. what a great idea mli - shorting the lamp to the ABS one !! I think I will do this as a temporarry measure to get through the controle technique. The ABS light trick is a known one. I prefer to fix the problem first. If I can't, I will probably just disconnect the ECU, it may pass the MOT as it doesn't seem to be in the list of MOT defaults. je ne suis pas sur en angletere, mais on france il faut allumer la lampe pour passer le controle technique. It is necessarry for the light to show and then to extinguish in order to pass the controle technique here in france.